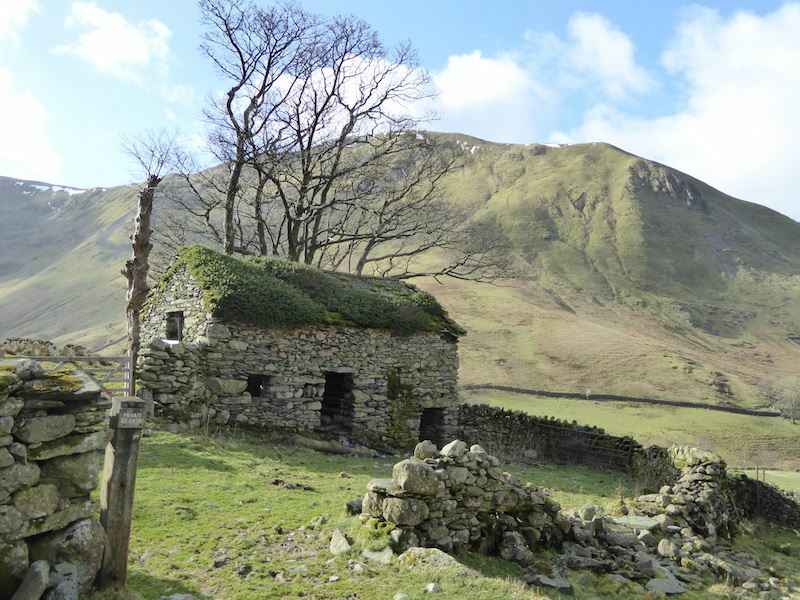 We’re off to have a walk over a few of the fells above Hartsop village today, thanks to a forecast for good weather. Its another one of those weather ‘windows’ which keep occurring between the windy, rainy days. It stayed fine all day although in the morning there was a strong wind which still had a chilly edge to it. 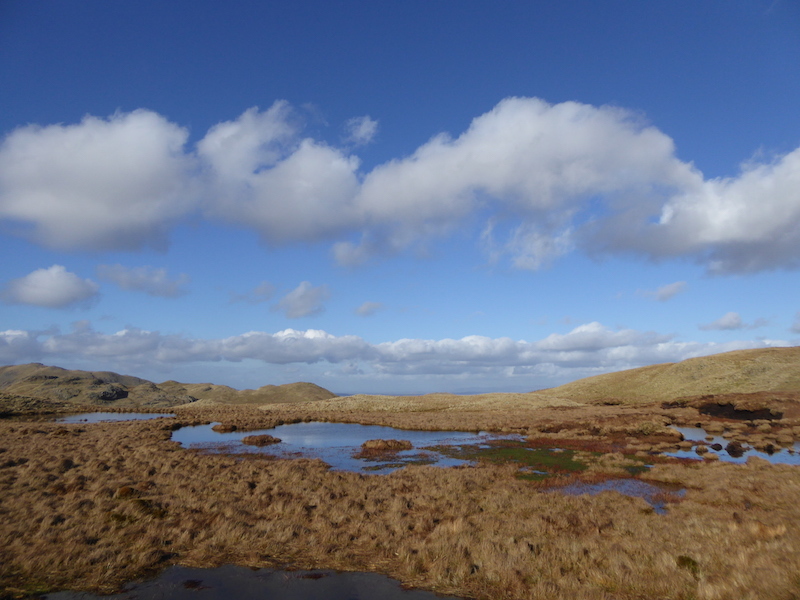 That gradually eased as the day went on and the afternoon was much less windy and much warmer. 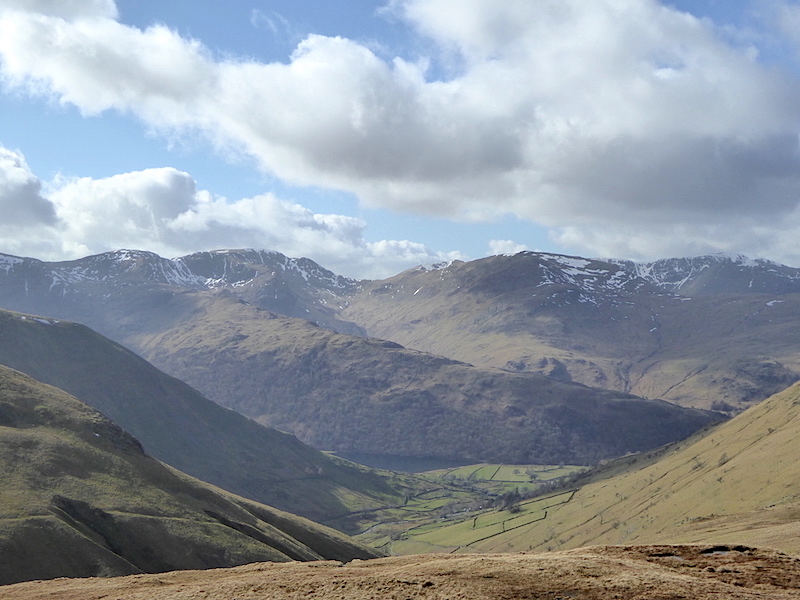 Here’s a view of Brock Crags as we take the path from Hartsop up to Haweswater. 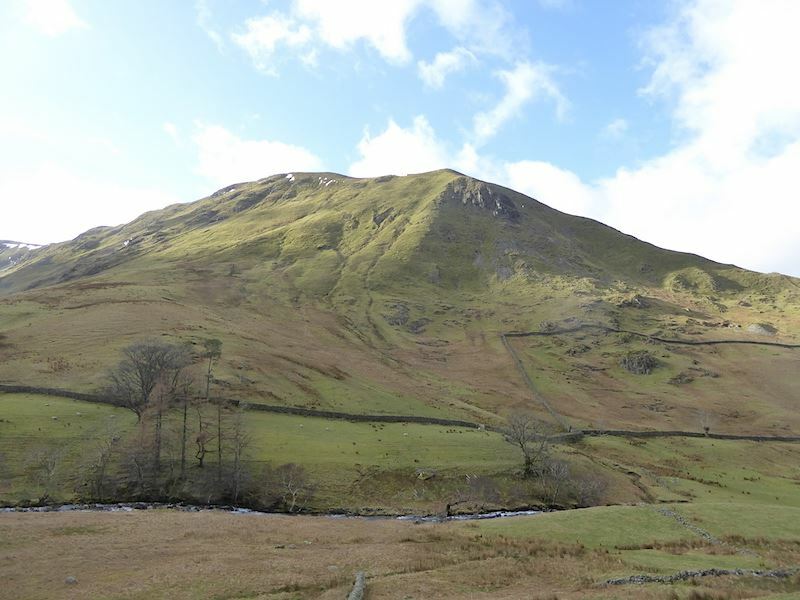 On the other side of the path is Hartsop Dodd, its a steep climb up if you start from Hartsop. Behind us is Saint Sunday Crag on the skyline behind Harstop above How. A green roof, this started growing long before they became the latest ‘in’ thing. 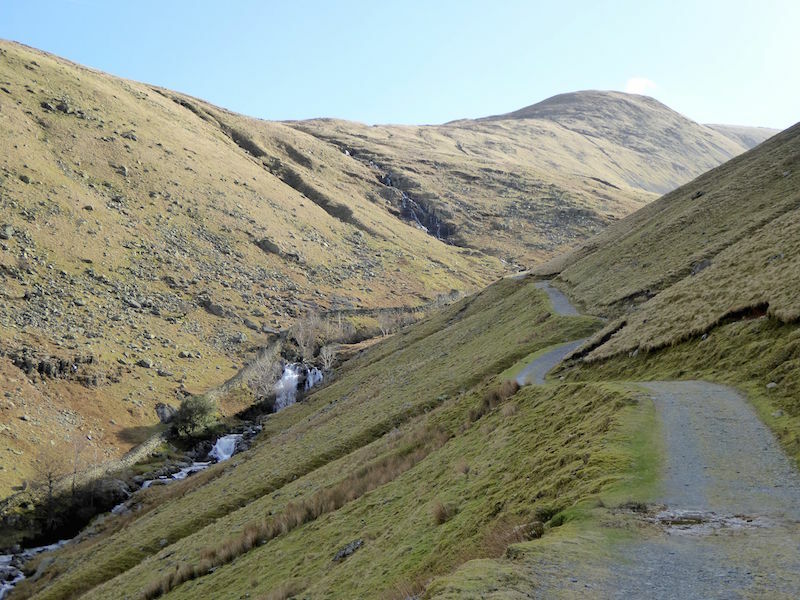 Making our way up the path alongside Hayeswater gill. Plenty of water in there today thanks to the recent snow melt. 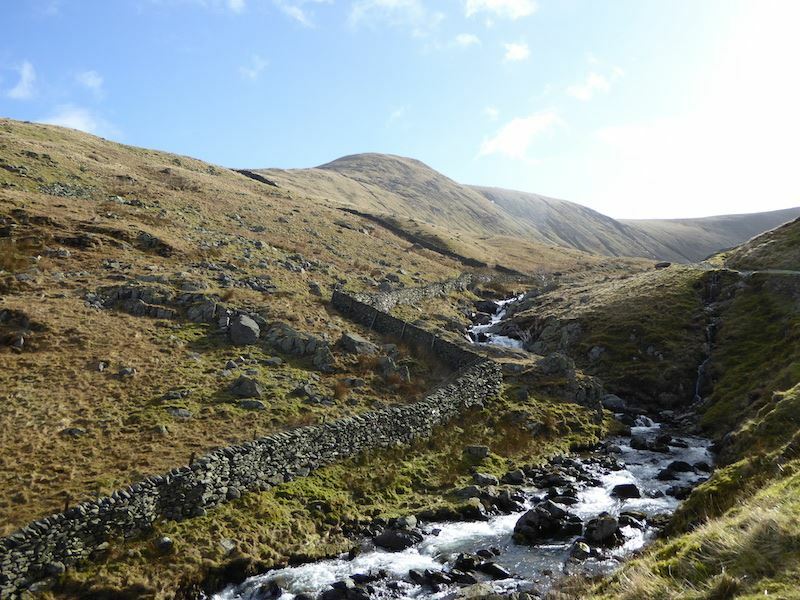 We’ve crossed the gill and are now making our way up to The Knott. 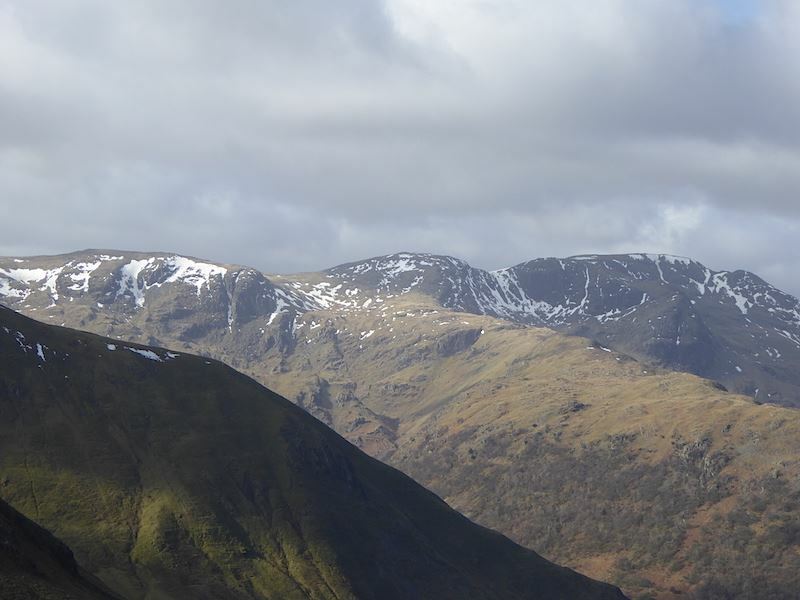 A look at the skyline us behind reveals, from left to right – Fairfield, Saint Sunday Crag, Helvellyn and the pointed peak of Catstycam. 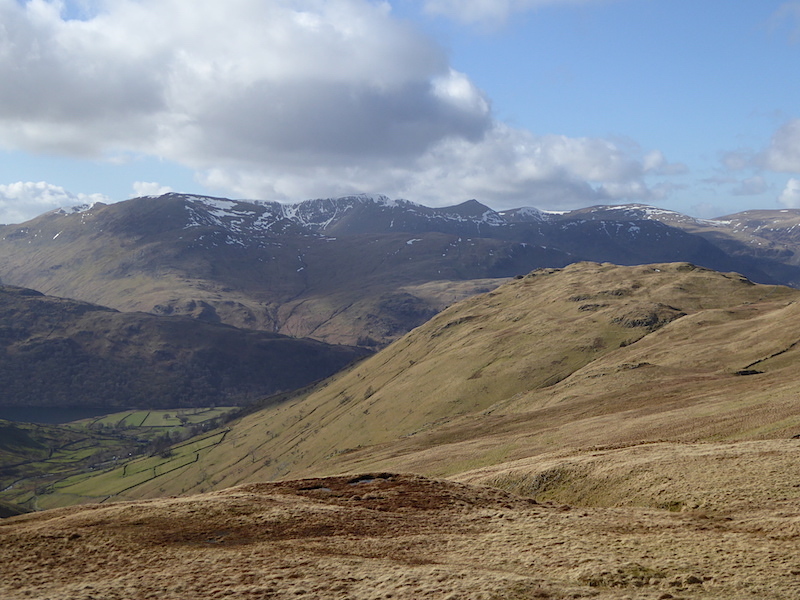 Looking across to our right and on the skyline from the left are Dove Crag, Hart Crag and Fairfield. 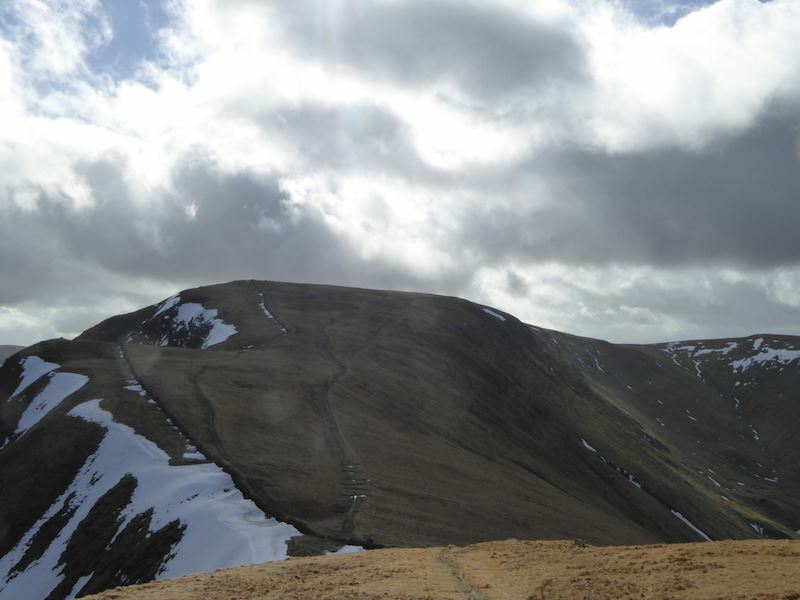 From the path to The Knott, a look to the left gives us a view of Rest Dodd. 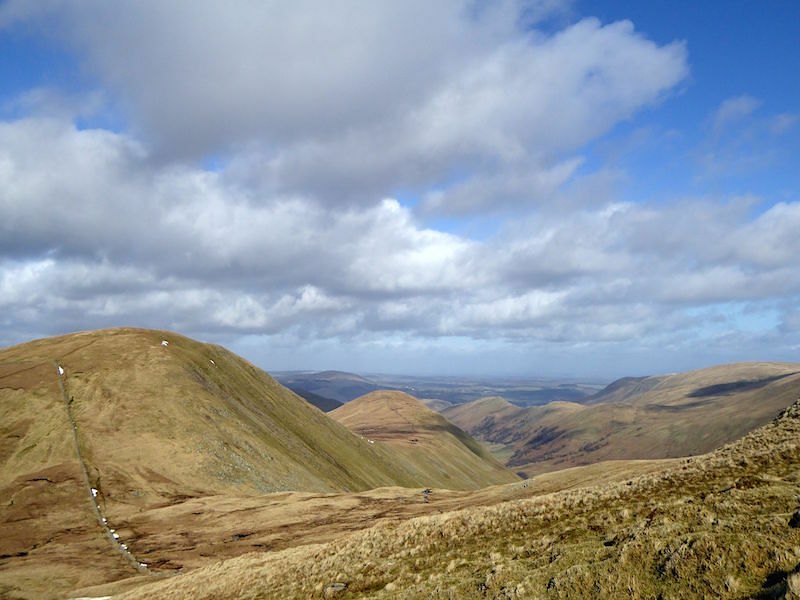 The fell in shadow on the left is Bonscale Pike and rising from there is the Loadpot Hill and Wether Hill range, which in turn leads to High Raise. 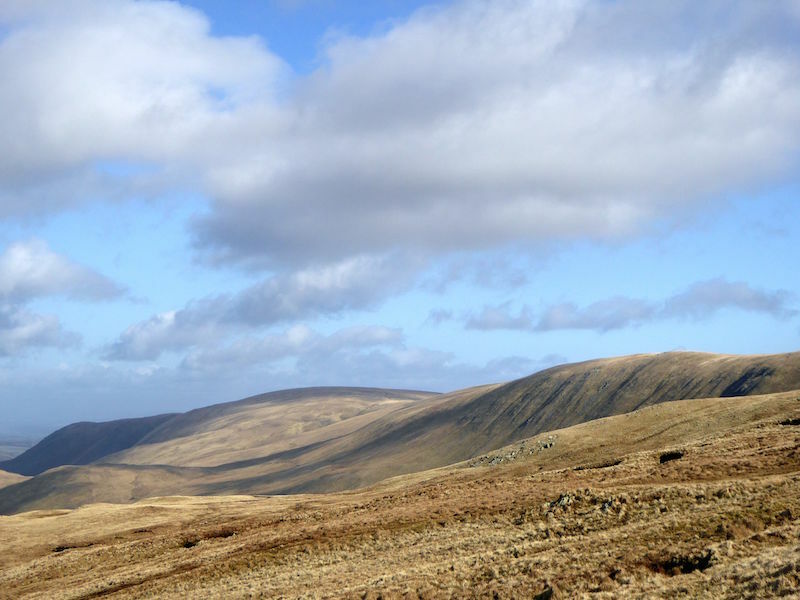 We’ll be at High Raise later on but there’s the little matter of getting up to The Knott first. Its one of those climbs which sometimes you think is never going to end, today was one of those days, especially as the gusty wind wasn’t helping either. 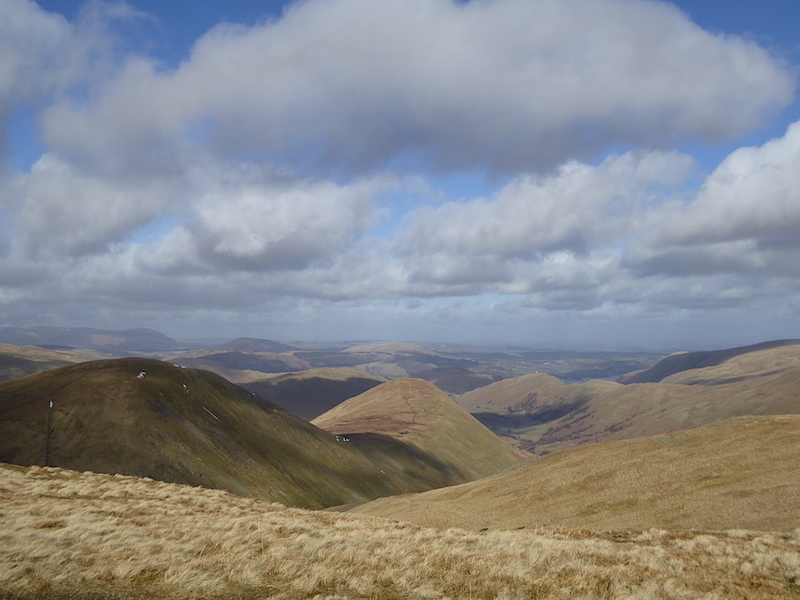 Looking at Rest Dodd again, and now we are higher we have a view of The Nab just below it. Not a deer in sight today, again. 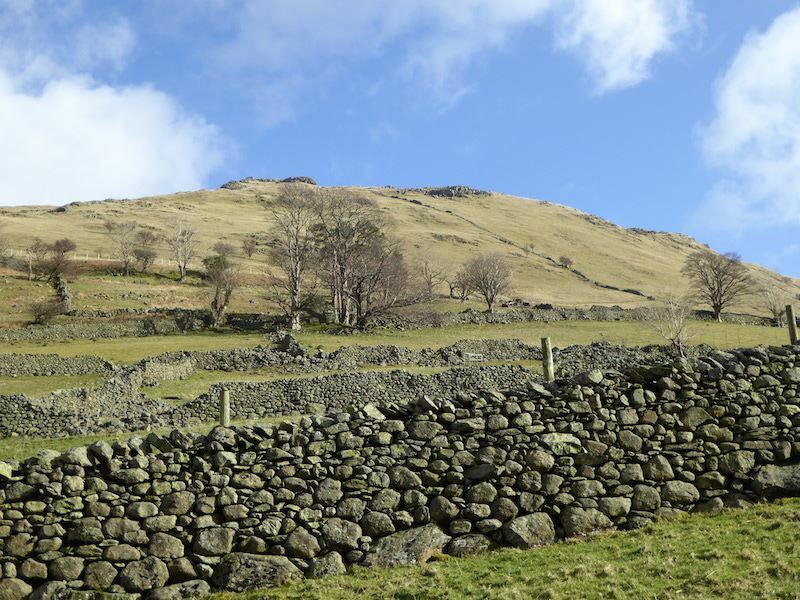 Its supposed to be an area with plenty of deer but all the times we’ve walked on The Nab and these fells we have never seen one, let alone a herd of them. 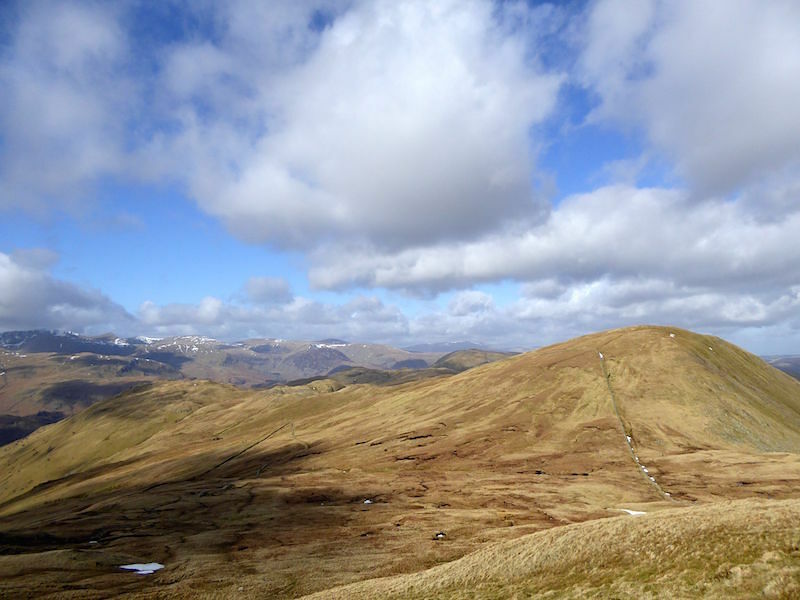 Rest Dodd again but now with Brock Crags to the left of it. Higher still but not at the summit yet. 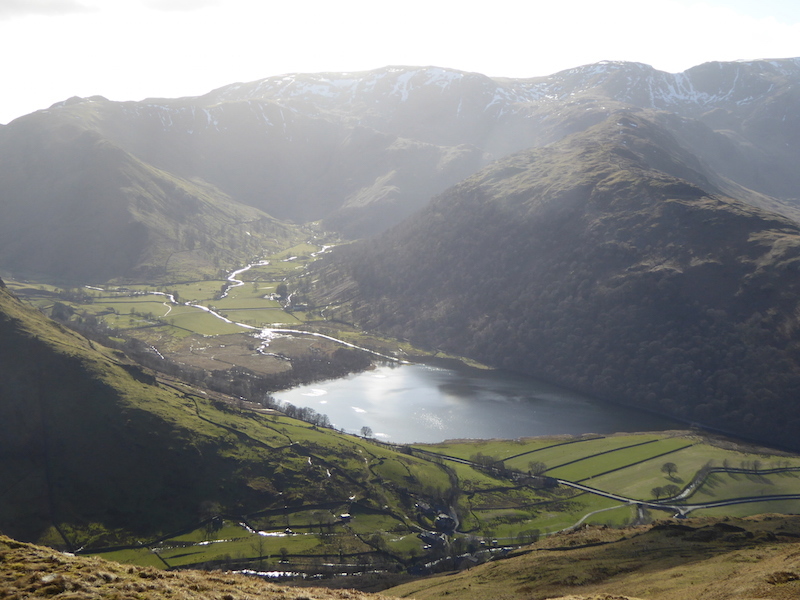 Down below we have a glimpse of Brothers Water just below Hartsop above How. 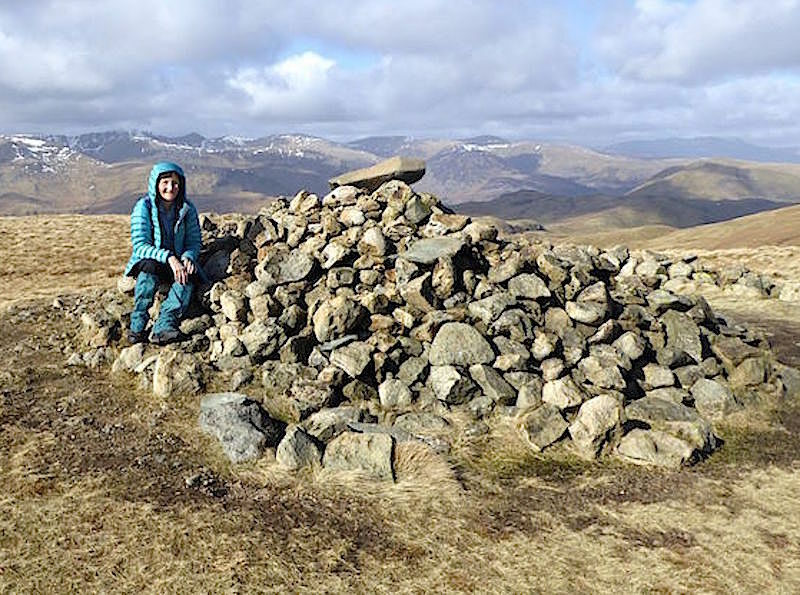 Hallelujah, we’ve reached the summit cairn on The Knott. Six days ago it was covered in snow. 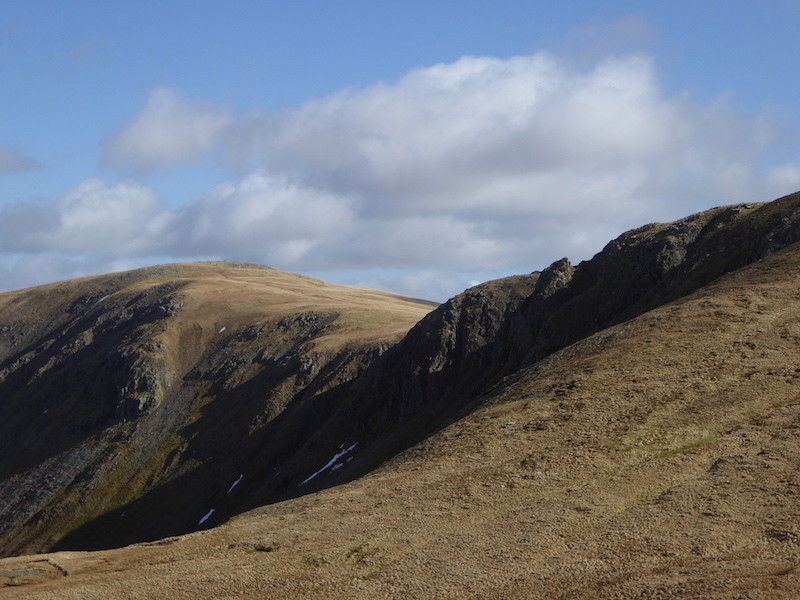 Looking over Rampsgill Head to High Raise. 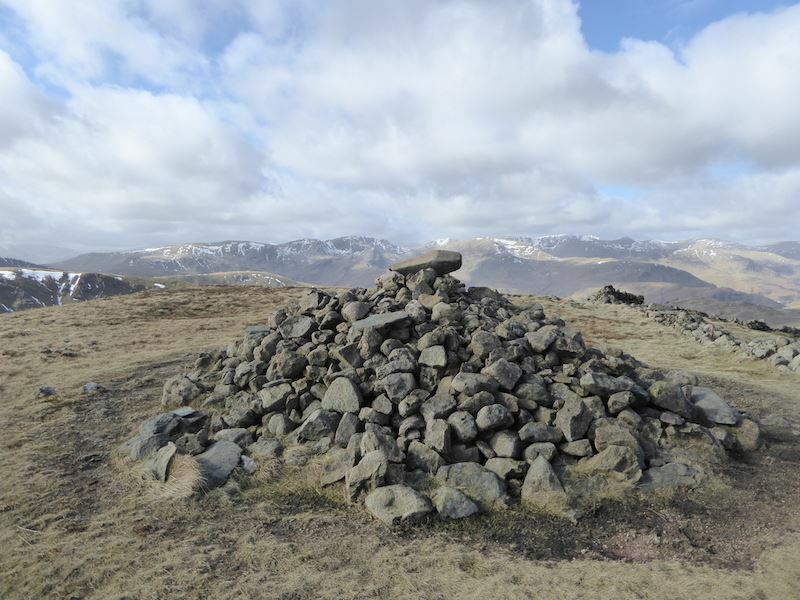 A view northwards from The Knott summit cairn. 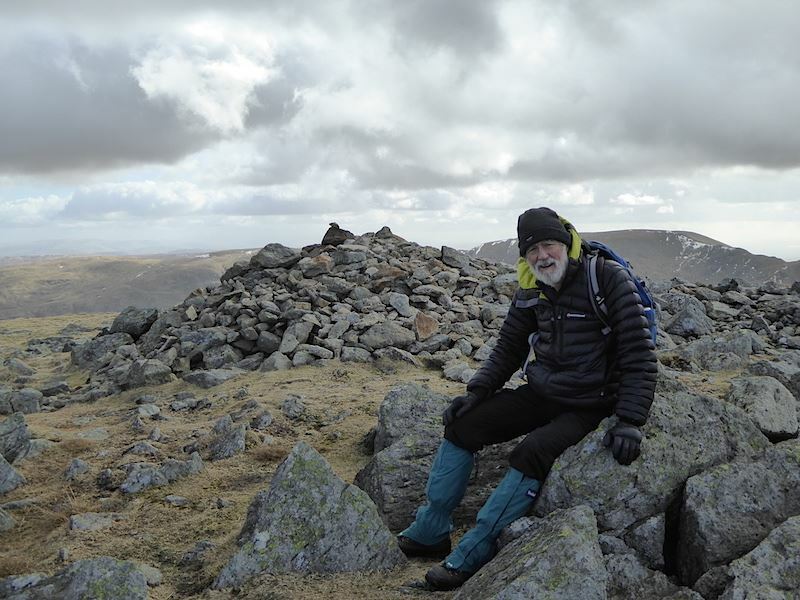 A very strong and chilly wind up here today so we didn’t hang around for very long. Making our way over to Rampsgill Head and behind us is High Street, we never saw a soul on it all the time we were up here. 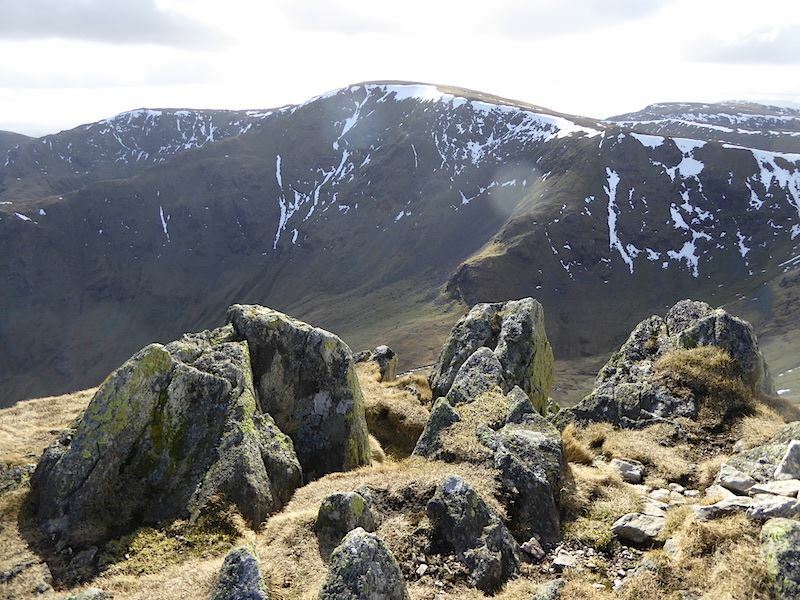 Looking over Long Stile to Mardale Ill Bell. 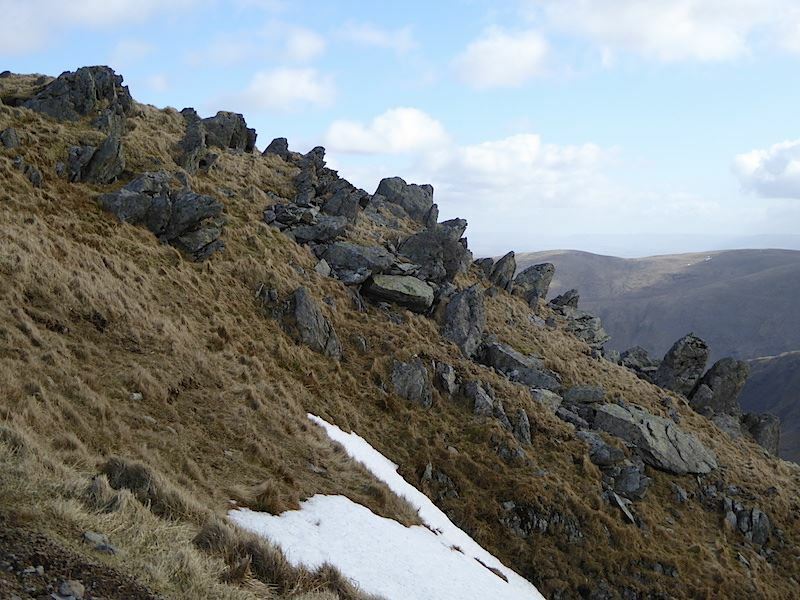 Caspel Gate gets a splash of sun between its shaded neighbours, Rough Crag to the left, and Long Stile to the right. 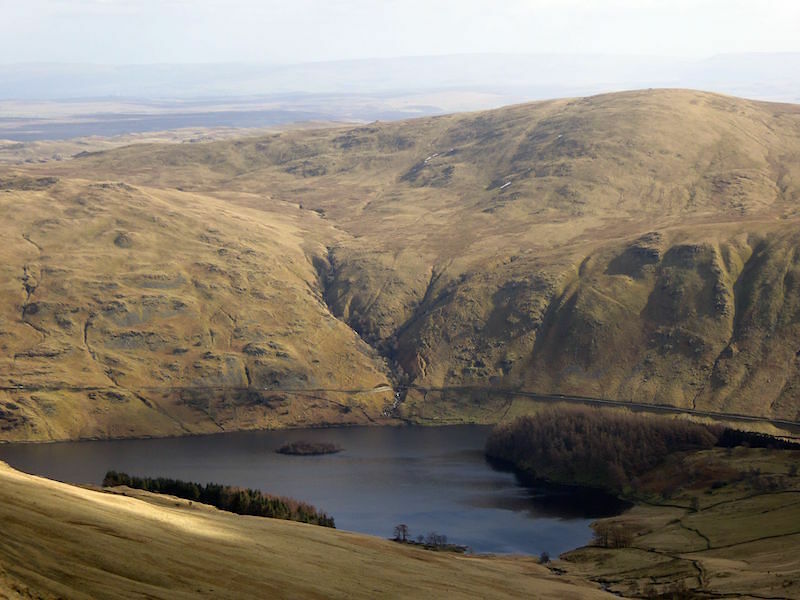 A close up of the southern end of Haweswater, with Selside Pike on the skyline over to the right. 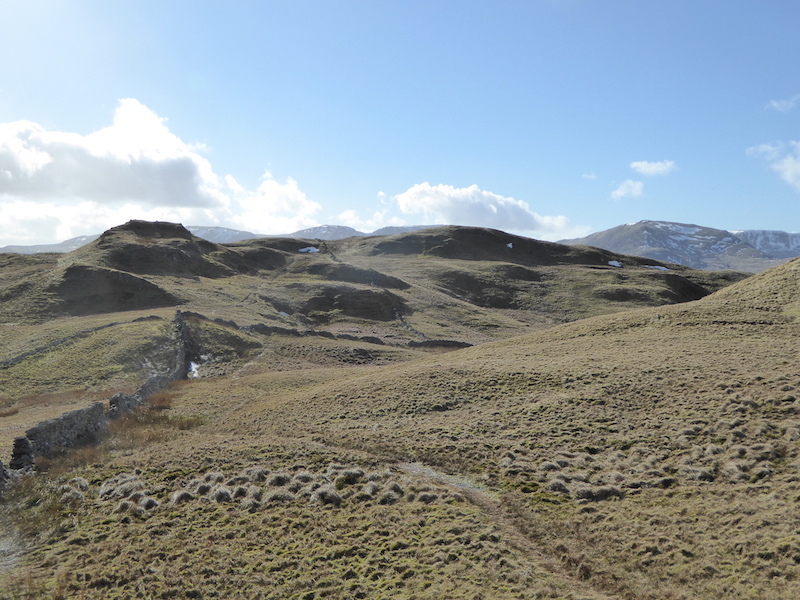 Onwards and upwards towards Twopenny Crag. 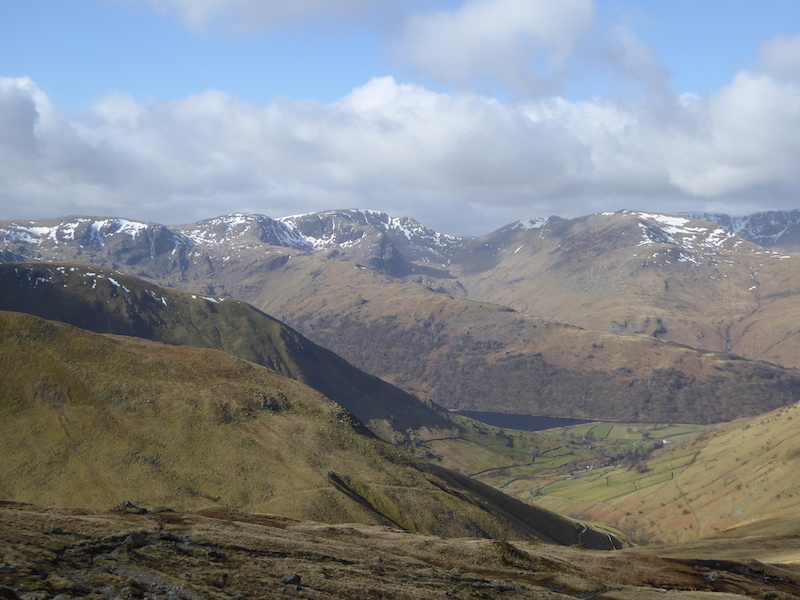 To the right of it is Kidsty Pike. Some of Twopenny Crag’s crags. 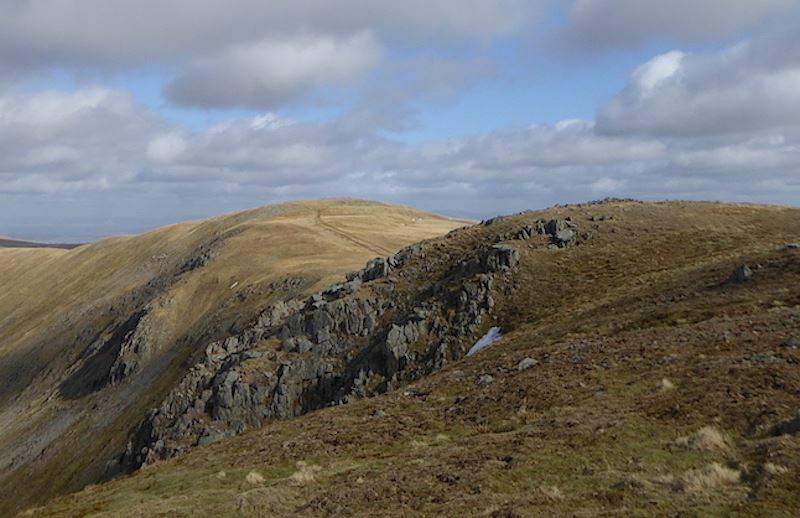 Looking across to High Street again, and to the right of it, Thornthwaite Crag. Somebody turned the light out and it became very chilly indeed at this point. 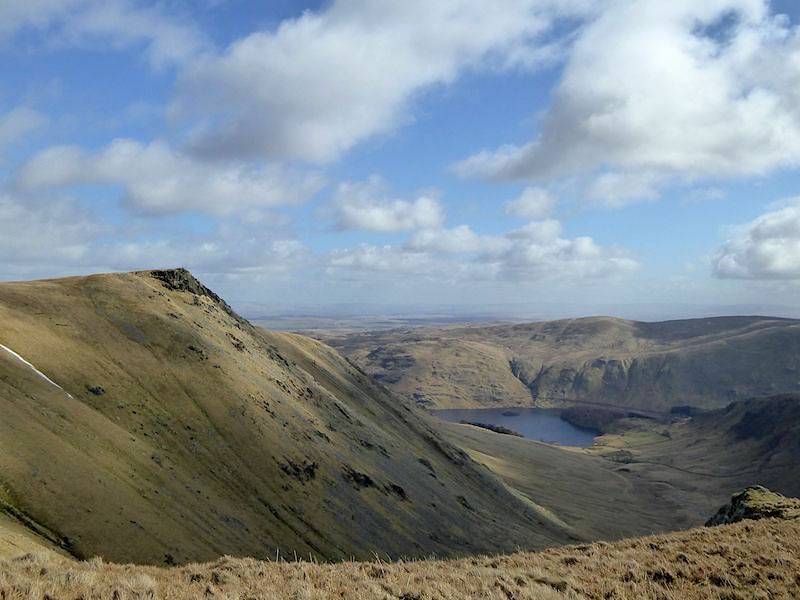 Kidsty Pike and Haweswater hanging on to the sunlight. 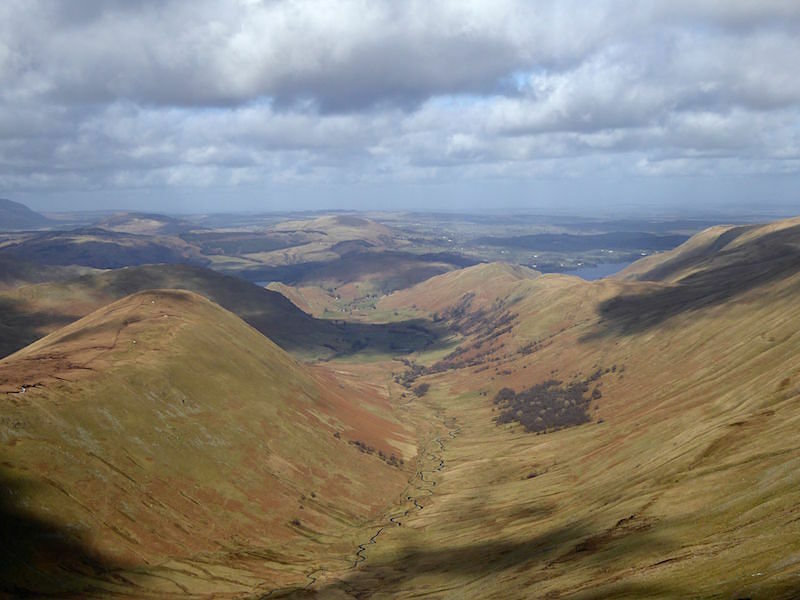 From Rampsgill Head there’s a fine view down Ramps Gill, and just a glimpse of Ullswater. 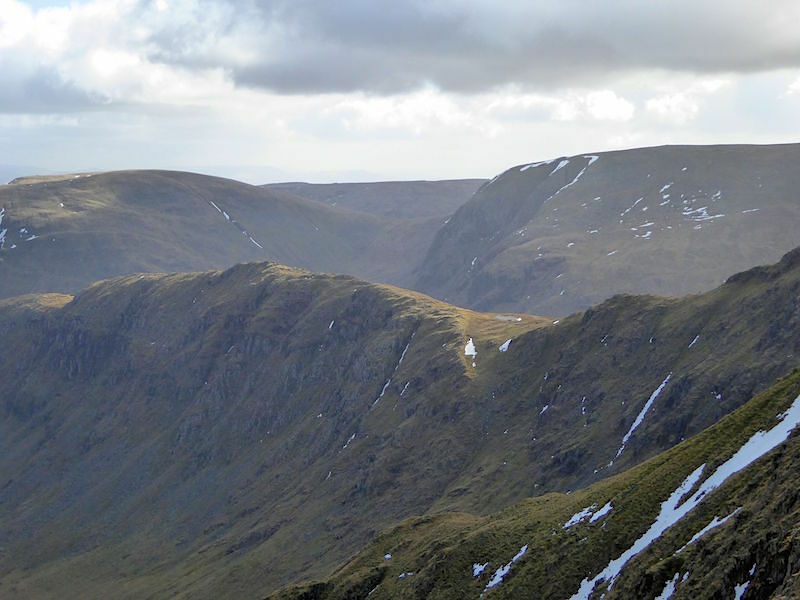 High Raise, in the centre, from Rampsgill Head. That’s where we’re off to next. High Raise and the shelter, alas it was occupied so we had to hang around in the chilly wind before we could have our lunch. 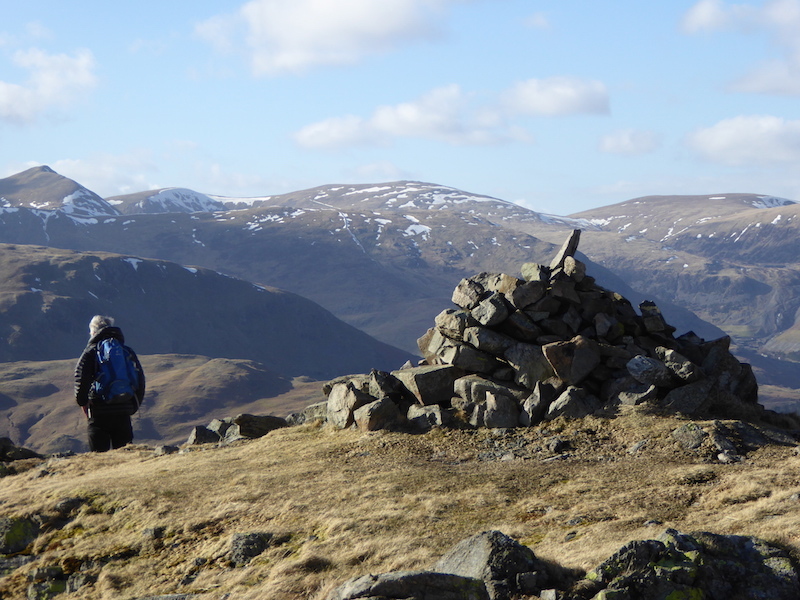 After lunch it was back over to Kidsty Pike. 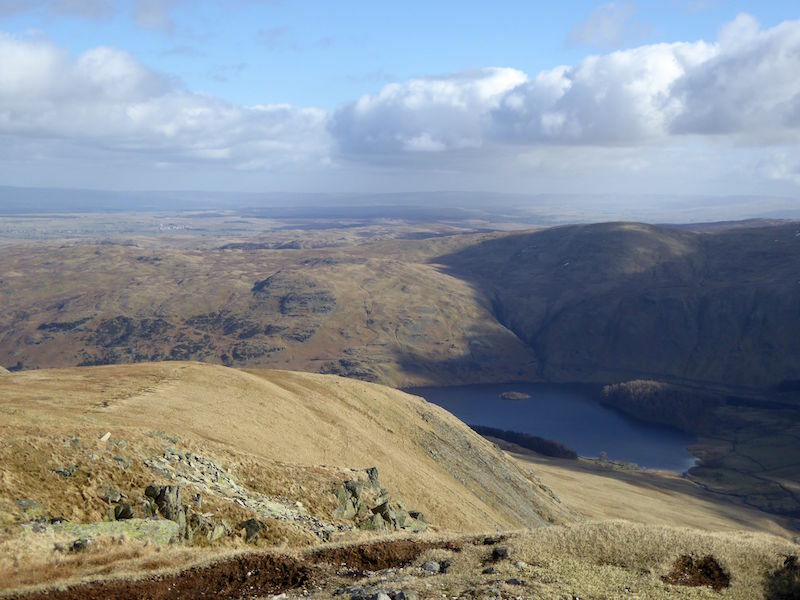 From there this is the view looking eastwards to the Pennines across Haweswater. 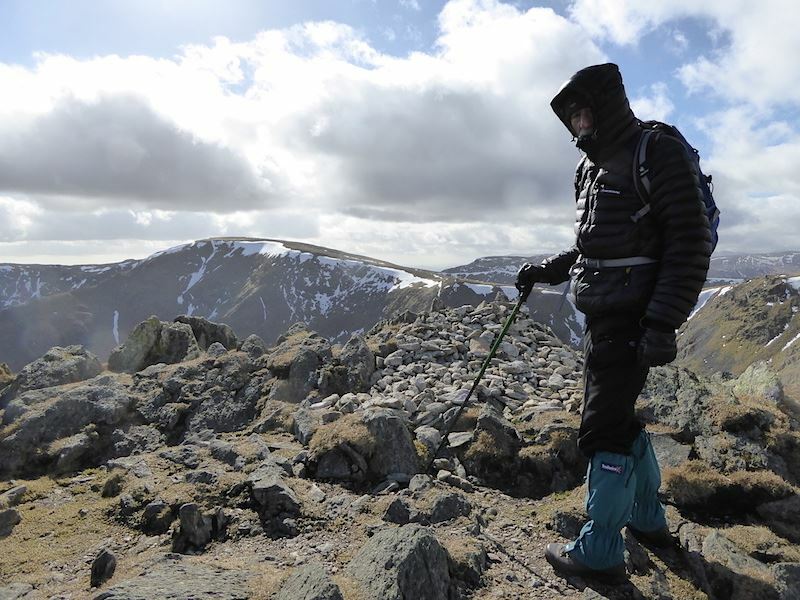 It might be sunny, but it was bitterly cold in the wind on Kidsty Pike. 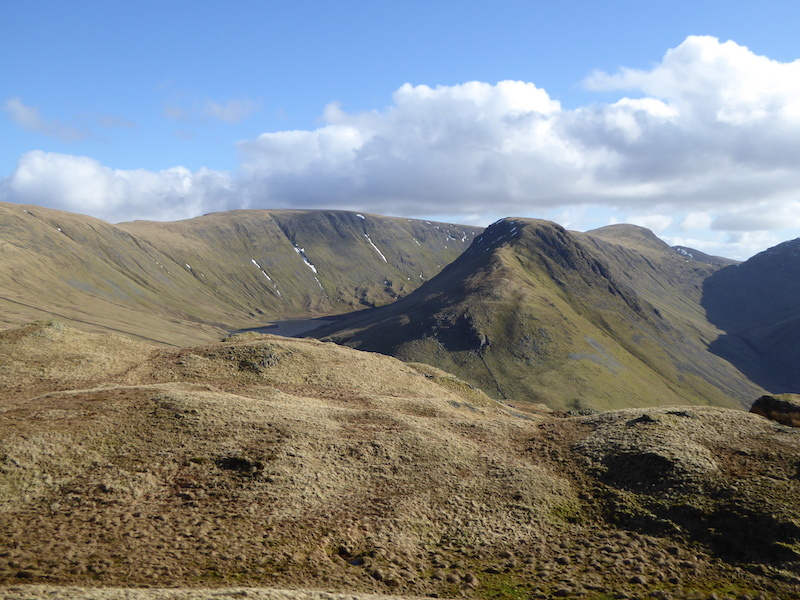 Looking over to High Street from Kidsty Pike. 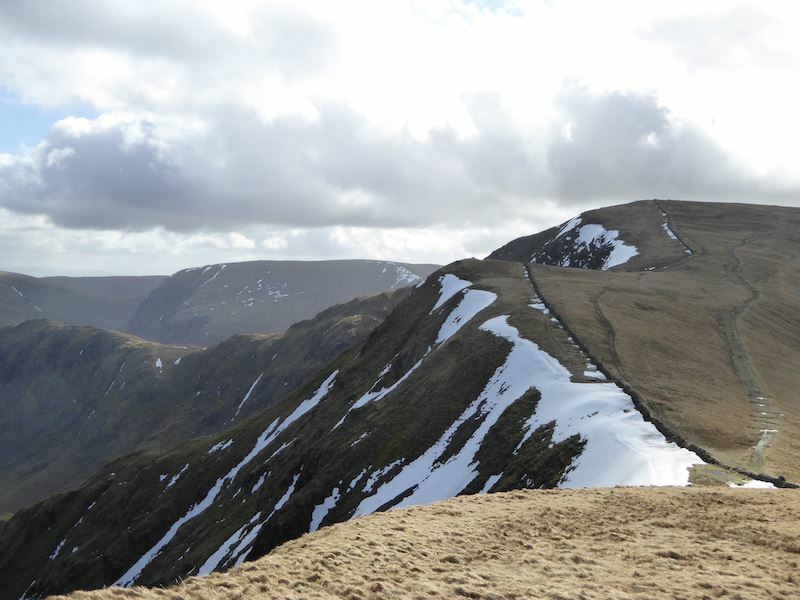 To the left of High Street is Mardale Ill Bell. 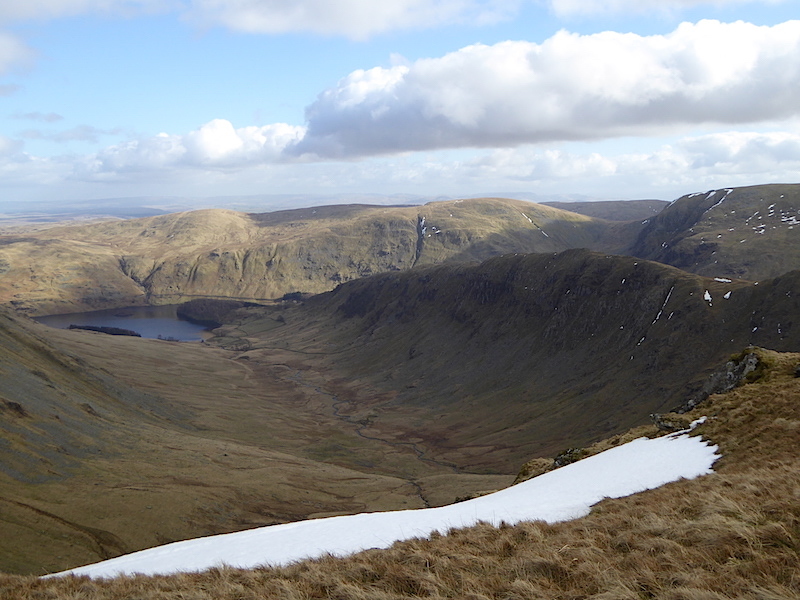 Leaving Kidsty Pike now and looking down Riggindale to Haweswater. 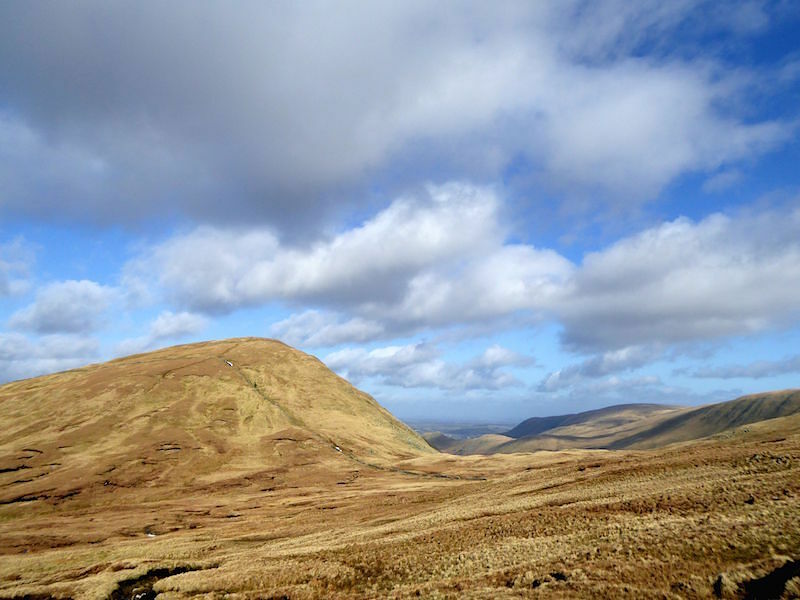 As we make our way over to Brock Crags on our left is Hayeswater shimmering in the afternoon sunlight. The wind has eased and it is now much warmer than it was this morning. 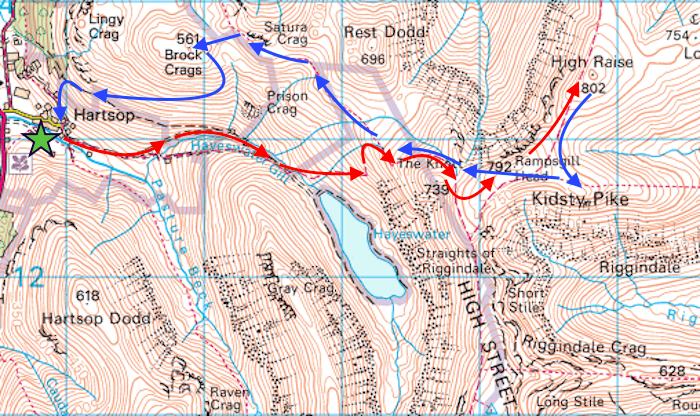 Brock Crags ahead of us, but there’s still a bit of way to go before we get there. 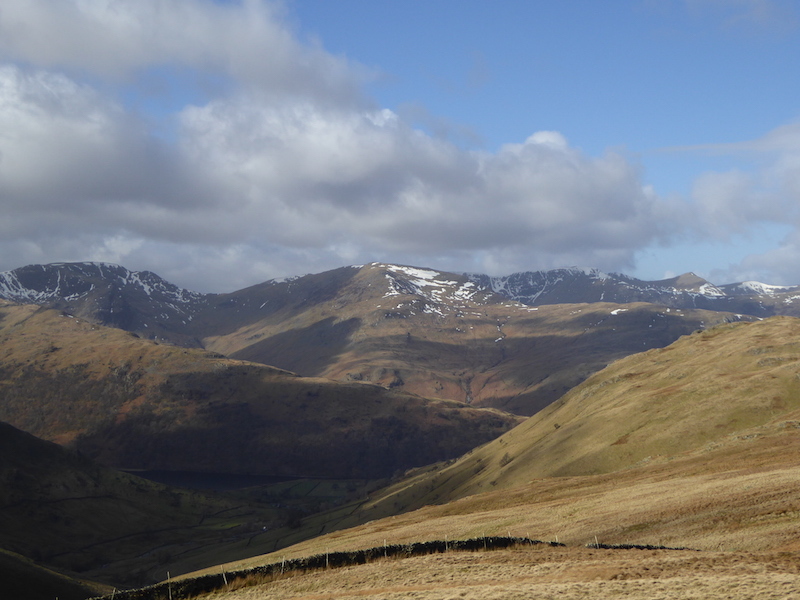 Looking westwards towards Deepdale Hause, the low point on the skyline. 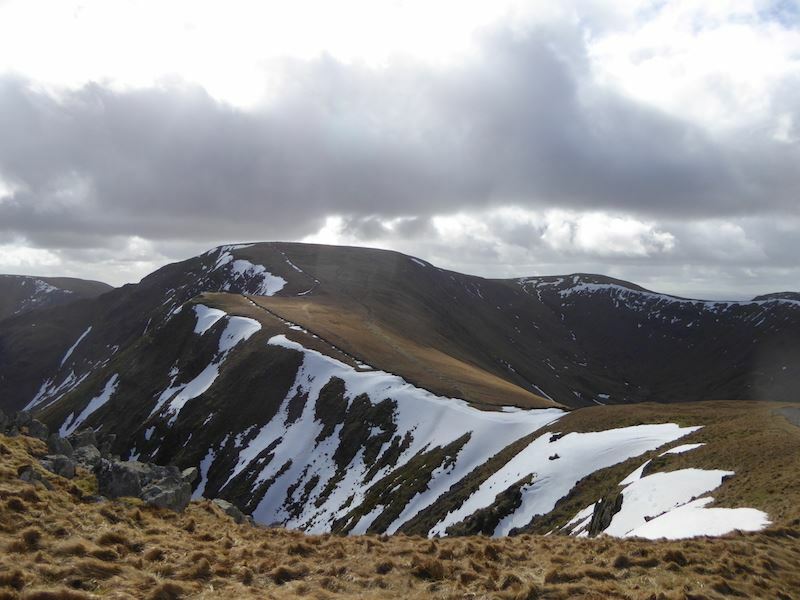 Only a few patches of snow remaining on the higher fells now. 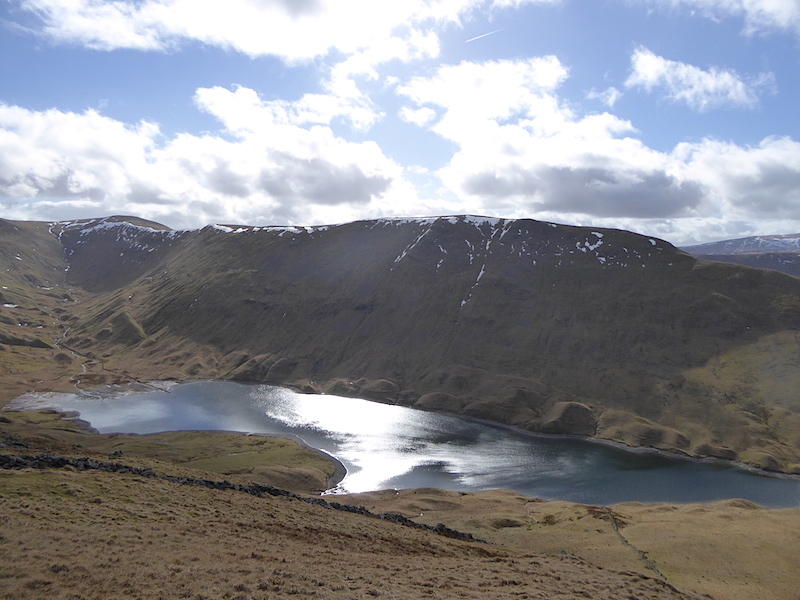 Hayeswater nestling between High Street on the left and Gray Crag on the right. 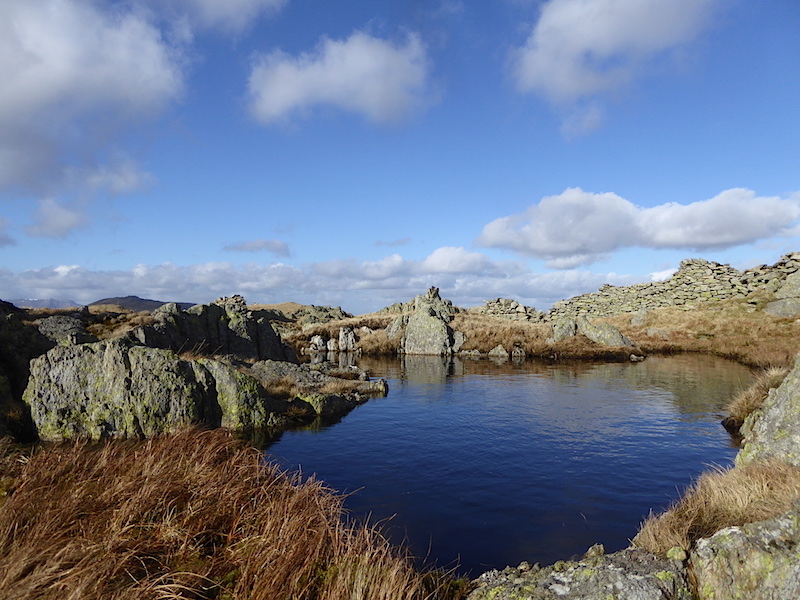 A pool just off the path on the way towards Brock Crags. 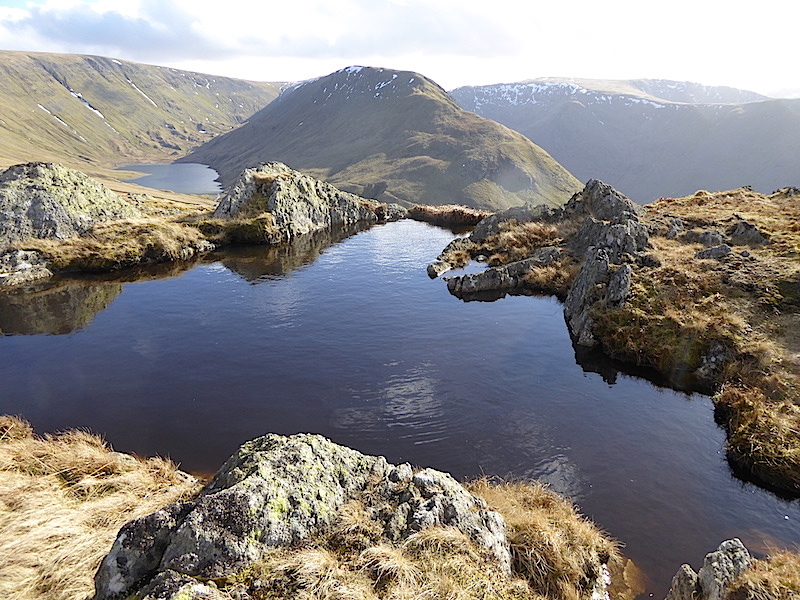 Another view from the same pool, looking south towards Gray Crag. 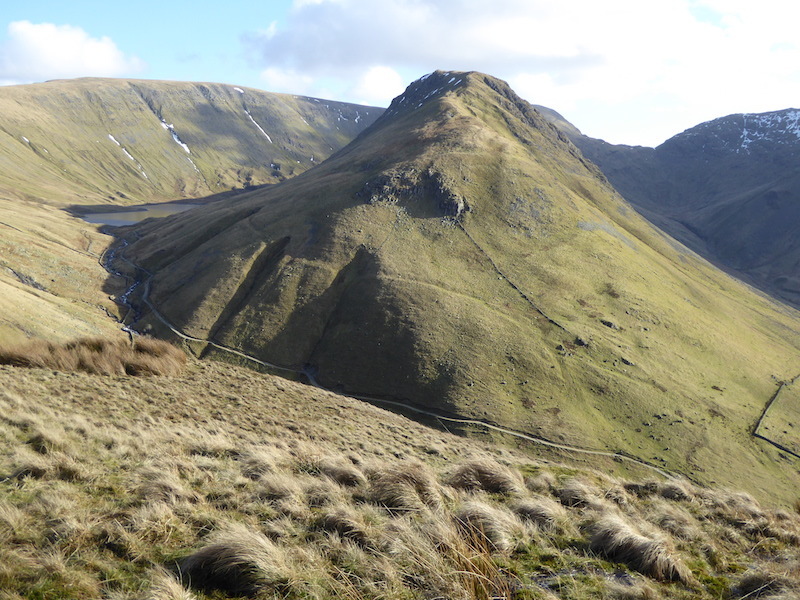 At this point we leave the main path and head over to Brock Crags. 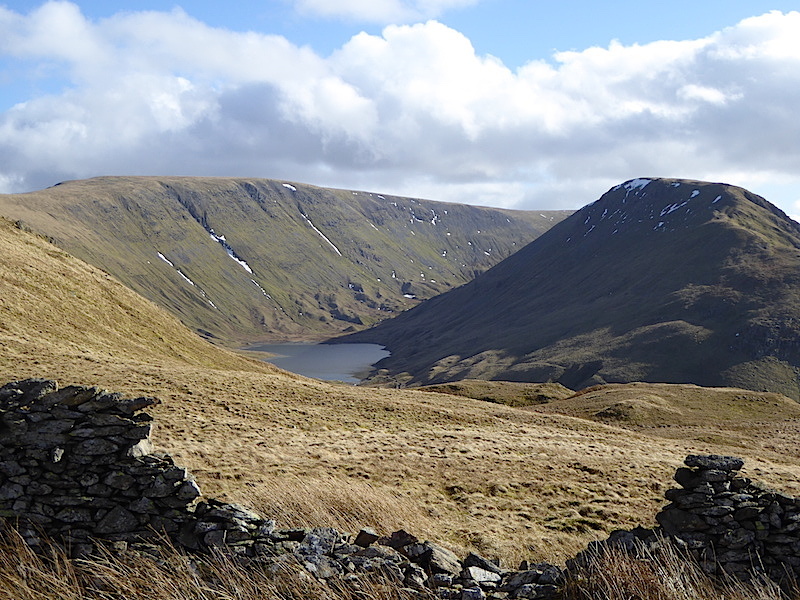 Looking through the collapsed wall at Hayeswater and High Street. 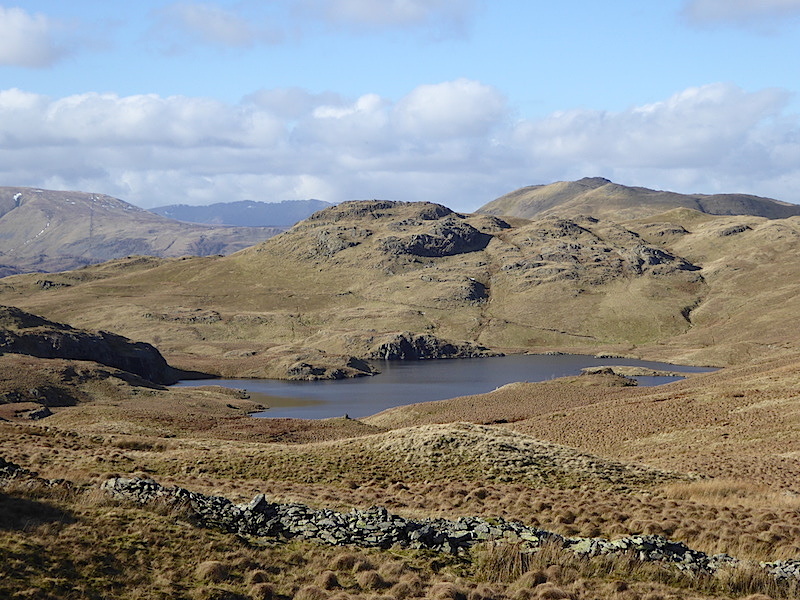 As we cross over to Brock Crags there’s a view of Angle Tarn, a very popular spot in summer but there’s no-one around today. 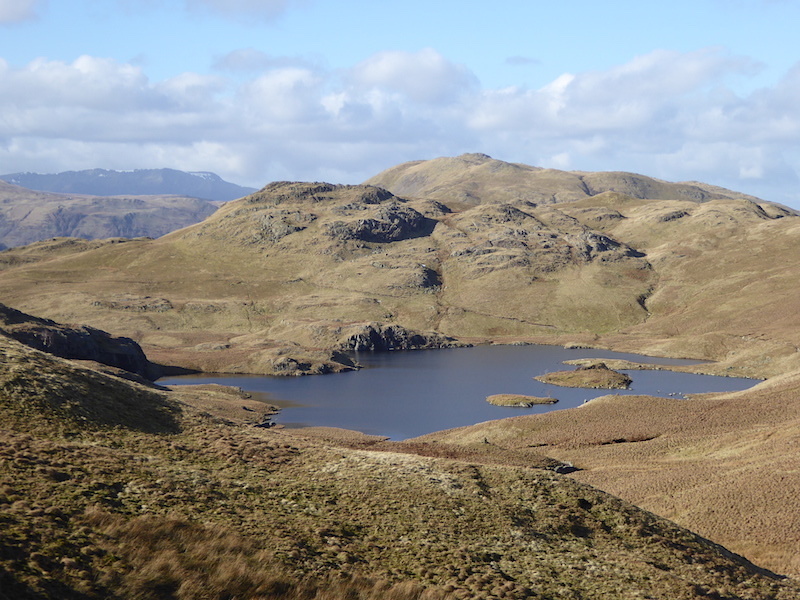 Another view of Angle Tarn from a bit higher up. Angletarn Pikes just above it and Place Fell beyond them. 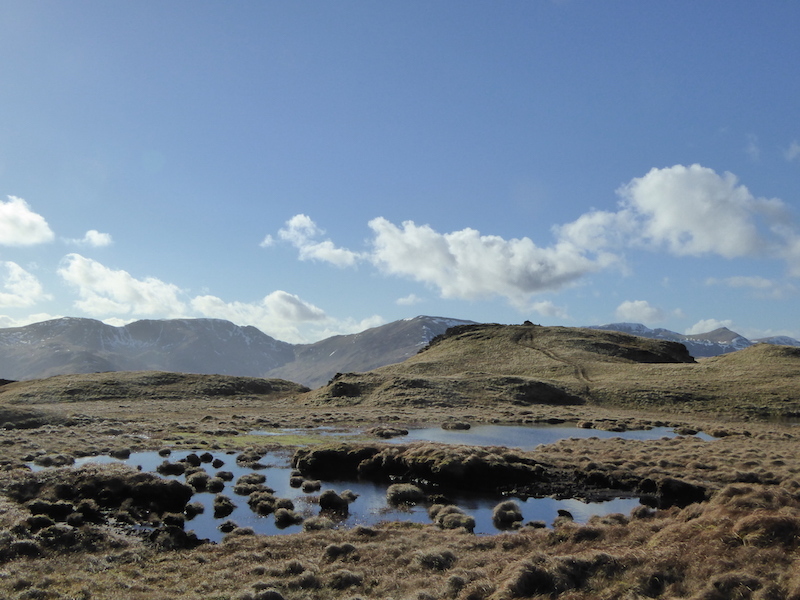 A view of Brock Crags across the very boggy area in front of it. The path skirts around this but that can get a bit squelchy at times too. Skirting round the wetness, with the reflections of the sky in the pools making them look a little more attractive than they really are. 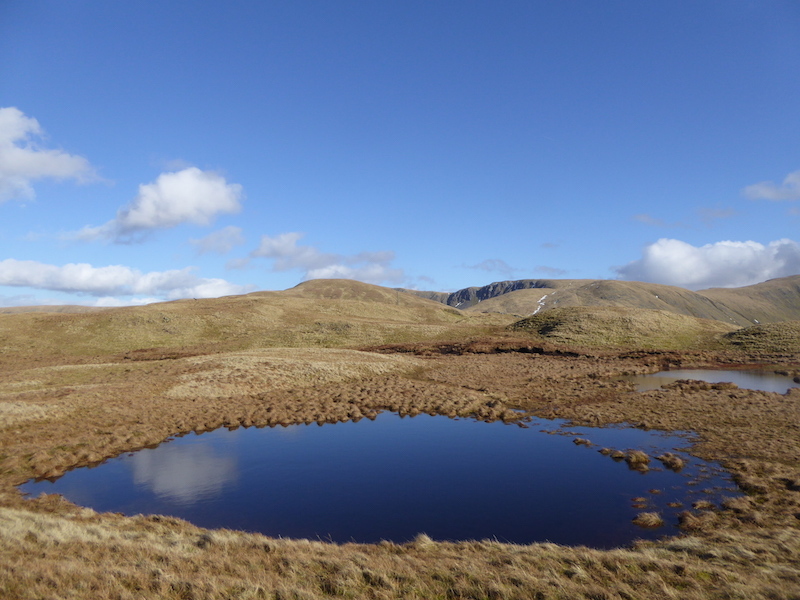 Across this pool you can just make out the dark mass of Rampgill Head with a tiny part of High Raise to the left of it. 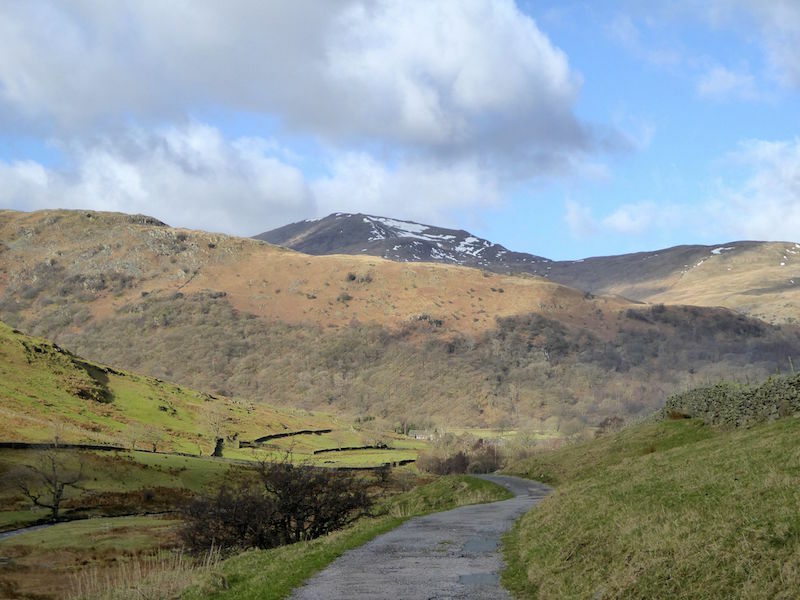 High Street on the left skyline, Gray Crag to the right, and rising beyond and to the right of that is Thornthwaite Crag. 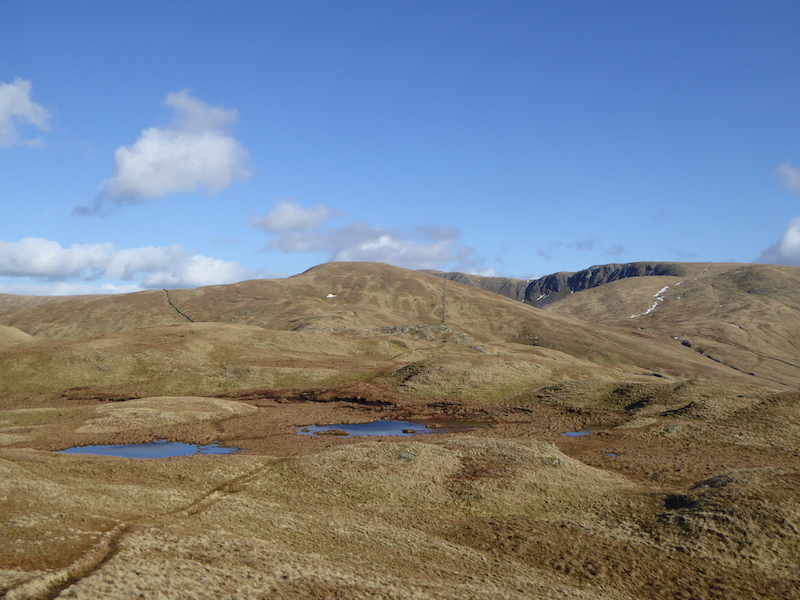 Looking east over the pools to Rest Dodd in the centre of the picture. 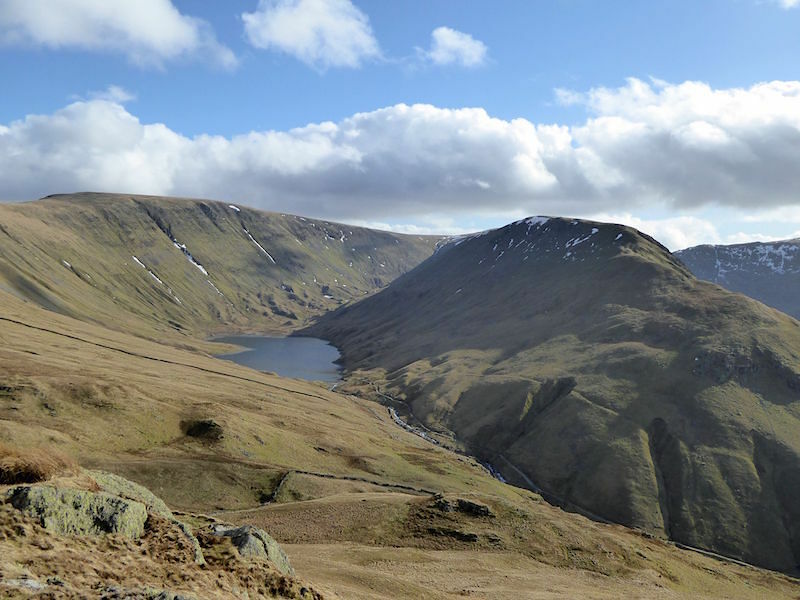 A view of Brothers Water from Brock Crags. 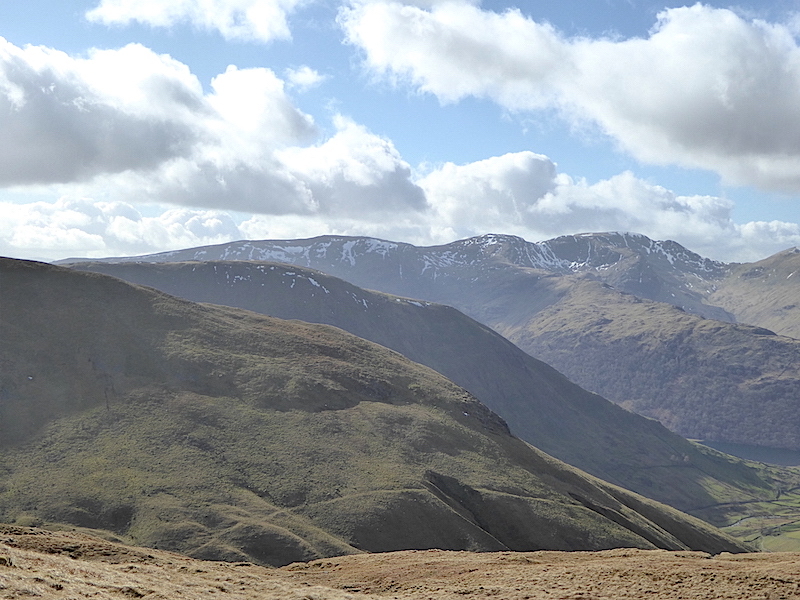 Gray Crag looking very imposing in the sunshine as we leave Brock Crags. The path below it is the one we used on the way up this morning. Well, that was an enjoyable walk despite the strong chilly wind in the morning. 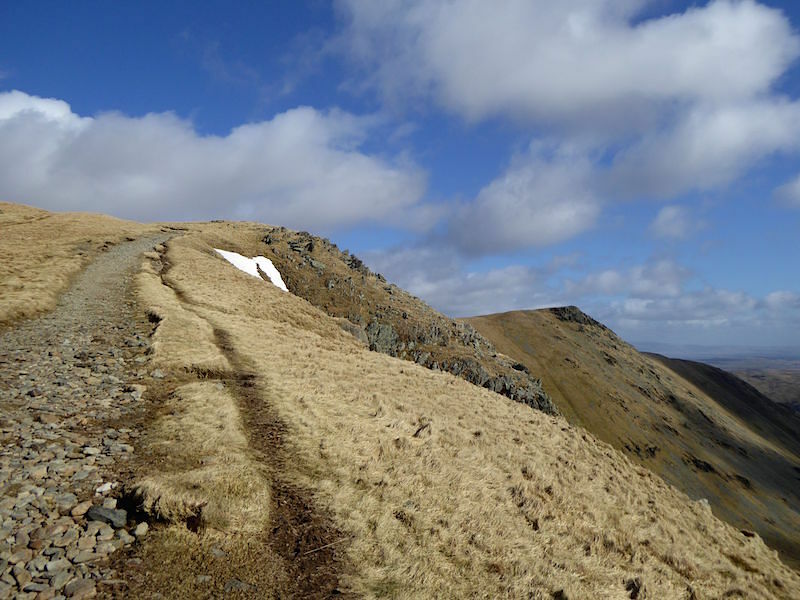 Now we just have to make our way back down to Hartsop, which will be done using an easy little path which runs just below us along the side of Brock Crags.